Yamaha’s been on a roll lately, with bikes like the FZ-09, FJ-09 and FZ-07 stealing headlines by proving that affordable and competent motorcycles aren’t synonymous with dull and boring. If that wasn’t enough, Yamaha also unleashed the new YZF-R1 and R1M to the masses, showing the world in one swift kick how far it can push the boundaries of technology on two wheels. Combine these models with the Tuning Fork’s existing street lineup, and Yamaha’s portfolio is looking rather complete for the burgeoning street/sporty rider … except for one glaring area: it has nothing to offer newbs. That all ends now with the introduction of the R3 to the U.S. market. Yamaha reps admit the brand has had a hole to fill in the beginner market. Despite seeing the success Kawasaki was raking in for about two decades with its baby Ninjas, Yamaha decided to wait. 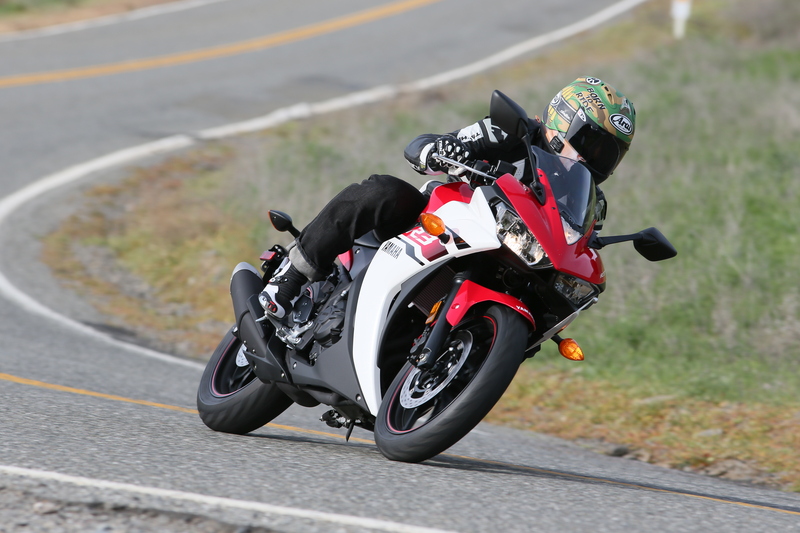 Then, when Honda released the CBR250R (and later CBR300R), the waiting continued. Making the situation more aggravating for American riders is the R25, Yamaha’s 250cc answer to the baby CBR and Ninja, not available Stateside. 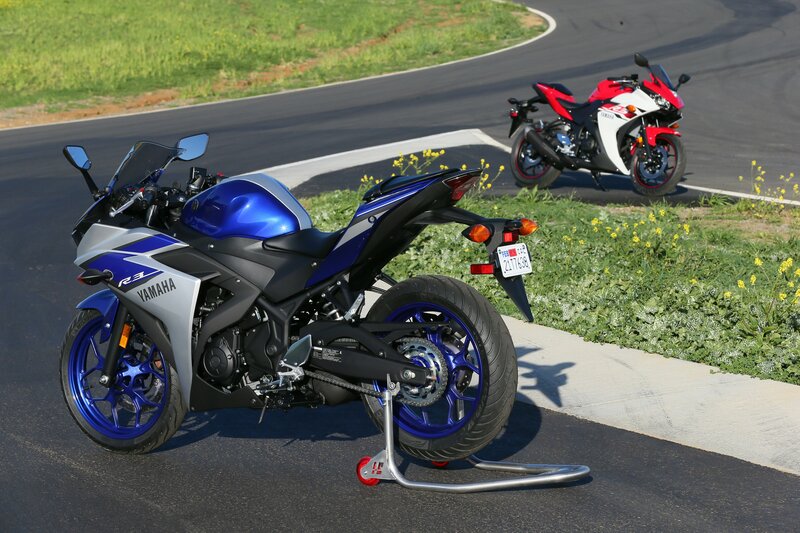 As an interesting aside, according to Yamaha, in the past 12 months the R6 and R1 were the top two sellers in the sportbike category, respectively. Personally, I think the Yamaha R3 is the best looking beginner bike on the market today. When trying to attract new buyers in hopes of keeping them loyal to the brand, this is an important first step. The tide has started to shift, however, with MIC numbers revealing the sub-500cc category doubling in sales over the past five years and more consumers in the sport/supersport genre purchasing the former over the latter. With this information, Yamaha felt it was finally the right time to fill in the hole in its small displacement lineup. The aim was simple, too – make this bike better than the Godfather of the beginner bike crop, Kawasaki’s Ninja 300. In this simple experience chart, plotting the amount of riding experience its competitor’s bikes are ideal for, Yamaha isn’t outright naming its competitors for the R3, but it kinda is. This is no easy task, as the Ninja hasn’t earned the status it has by being dull. However, the best place to start is with the engine. At 320.6cc, the DOHC parallel-Twin outclasses Kawasaki’s Twin by 25cc and is the same unit seen in the R25, punched out to a 68.0mm bore (vs. 60.0mm on the 250). Stroke stays the same at 44.2mm. A 1.2-liter airbox feeds 32mm Mikuni throttle bodies, with 12-hole injectors feeding atomized gas. The mixture passes through twin 26mm intake valves, where the forged aluminum pistons (you read that right) squeeze the mixture to an 11.2:1 compression ratio, and after the explosion, twin 22.5mm exhaust valves let the spent gasses escape to the two-into-one exhaust with three-way catalytic converter before escaping into the atmosphere. Like the R1 flagship, cylinders on the R3 are offset to reduce mechanical losses due to piston/cylinder friction. 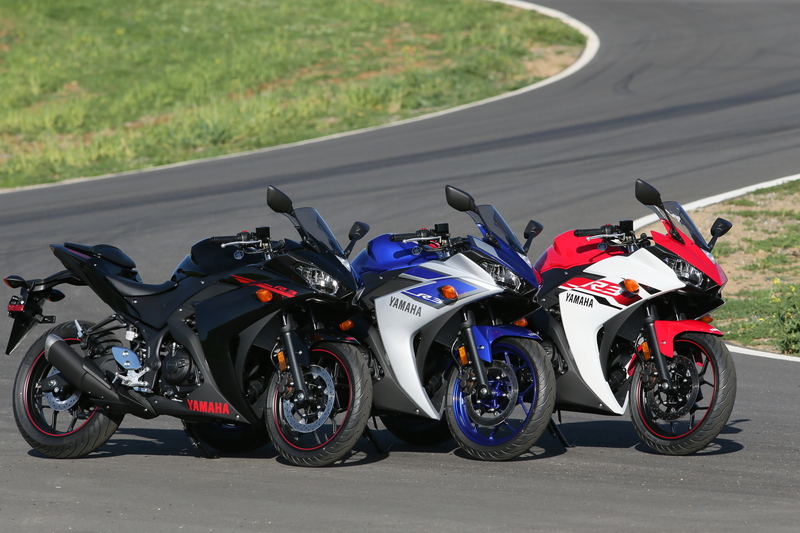 Unlike the R1, however, the R3 uses a more common, 180-degree crankshaft and not the 270-degree crossplane crank. 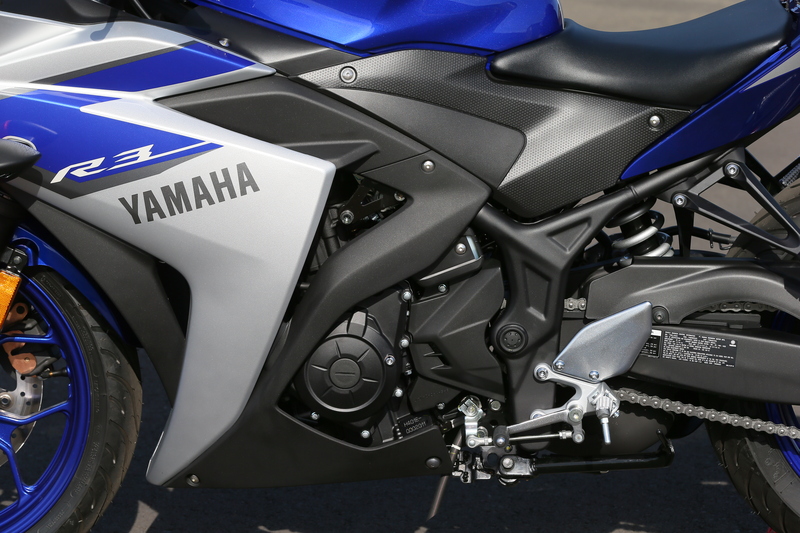 Yamaha says the advantage of the crossplane crank is to allow the rider to better manage high horsepower. Since the R3 makes relatively little power in comparison (approximately 42 hp according to Yamaha Europe), the Crossplane crank wasn’t necessary. Plus, the 180-degree crank allows for a much lighter primary balancer. Lurking underneath the bodywork is a 320.6cc parallel-Twin, with closed-loop fuel injection, four valves per cylinder, aluminum pistons, and offset cylinders. You know what it doesn’t have? A crossplane crankshaft. Things get slightly more traditional from here, with the engine being housed as a stressed member in a steel frame. Swingarm is steel, too, but not your standard box-section unit. Yamaha went the extra mile and stylized it a bit. KYB provides suspension at both ends; a 41mm fork and seven-way preload adjustable shock handling bump duties with 130mm and 125mm of travel, respectively. Some weight savings comes in the way of cast aluminum 10-spoke wheels, with 110/70-17 front, 140/70-17 rear Michelin Pilot Street rubber made specifically for the R3. A single 298mm disc is greeted with an Akebono twin-piston caliper. A single 220mm disc and single-piston caliper rest out back. All told, the R3, with its 3.7-gallon tank fully fueled, comes in at 368 lbs., says Yamaha, 11.3 lbs. lighter than the Ninja 300 (4.5-gallon tank), but also 11 lbs. heavier than the CBR300R (3.4-gallon tank). It’s hard to tell any difference without the other bikes to compare side-by-side, but what I did notice was how narrow and nimble the R3 feels between my legs. 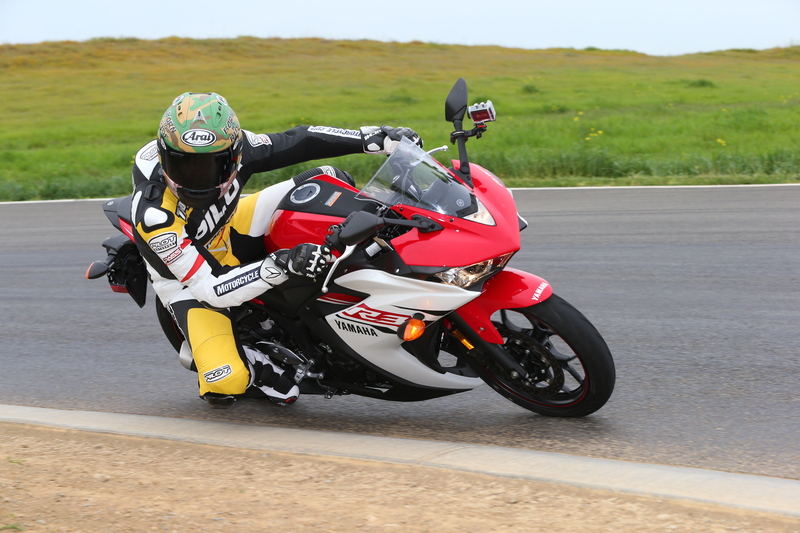 To test its ride qualities, Yamaha invited journos to Thunderhill Raceway in Willows, California, where we’d sample the bike on both the street and T-Hill’s new West track. Seating position is comfy on the R3. Bars are high and the pegs low. On the road, the R3 is pleasantly surprising for a beginner bike. Clutch pull is light and easy, and a short first gear makes it easy to ditch the traffic behind you once the light turns green. Gears are nicely spaced, and compared to a Ninja 300, there’s a noticeable difference in power throughout the rev range. A result of larger displacement, of course. The R3 can cruise easily at 80 mph in sixth gear, with plenty more revs available to overtake slower vehicles. Redline is a lofty 12,500 rpm. For kicks, I lurched down to 25 mph in sixth, opened the throttle, and the engine pulled cleanly up the revs. A progressive throttle pulley means ham-fisted new riders won’t get into as much trouble when they accidentally go WFO, though experienced riders would likely prefer a more direct pulley. That said, fuelling is spot-on. Riders young and old will appreciate the R3’s power – it’s still tame enough for a beginner, yet manages to be entertaining for an older rider who may be stepping down to something more manageable. 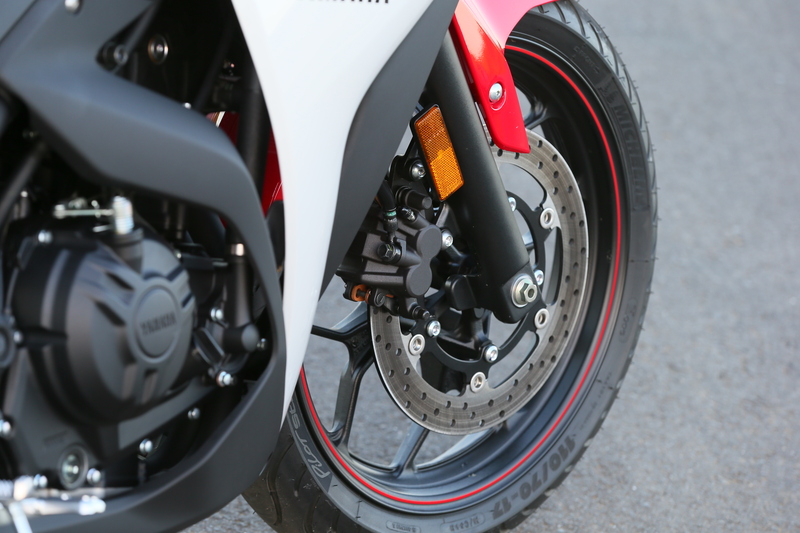 A single 298mm disc up front does the bulk of the stopping duties with its Akebono two-piston caliper. Note also the 10-spoke cast aluminum wheel and Michelin Pilot Street rubber. Clip-ons are placed above the triple clamp, giving the rider a sporty, but still relatively upright position. There’s also a little room to scoot about in the seat and the pegs aren’t too high, either. However, this is coming from someone who’s 5-foot, 8 inches. That said, some 6-footers on our ride didn’t have any complaints about seating position. Once into the twisty bits and the cast aluminum wheels help the bike turn with ease. The suspension is tuned for sporty-ish riding, and the KYB components did an admirable job dealing with the bumps. They started to lose their composure though when the quick pace was combined with rough patches of road, as neither end could rebound quick enough to provide a sure-footed feel. For the level of rider the R3 is aimed at, however, the components are just fine. Despite only having a single disc in front, braking duties didn’t leave much to be desired on the street. They’re surely not R1 units, but feel and power are on par with the Honda and Kawi. Yamaha calls the R3’s styling concept “R-DNA” and includes a mass-forward silhouette, “up-cutting” tail section, twin headlights and R6-inspired aerodynamic design. 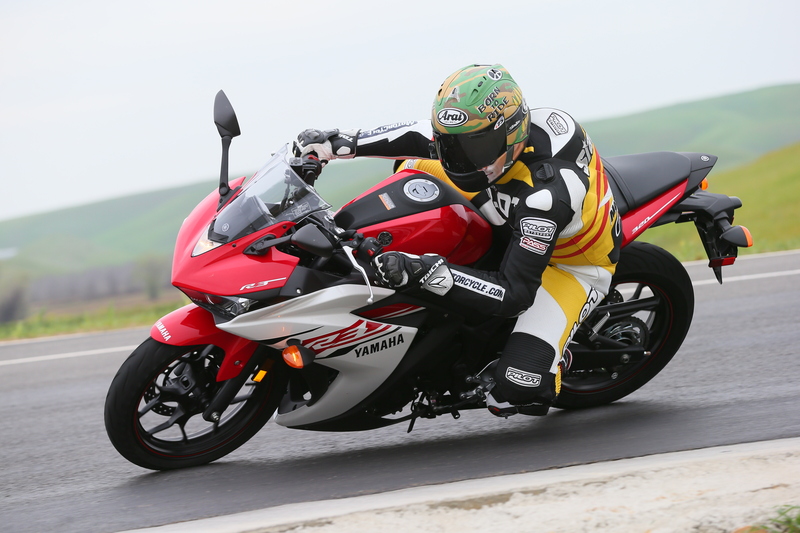 Even though a small number of R3 owners will take their bikes to the track, Yamaha treated us to some hot laps anyway, around Thunderhill’s West track, its latest addition. The two-mile course is tight and twisty, with plenty of elevation changes and a few blind corners. Basically, it’s perfect for the R3. With the growing resurgence in small displacement motorcycles in the racing scene once again, that small percentage of R3 riders who do track their bikes will be delighted to know it’s a great tool for the up-and-coming racer. From big to small, an R-series Yamaha has to be able to hold its own on a racetrack. The R3 succeeds in that mission. The light and nimble handling characteristics seen on the street directly translate to the track, with quick and easy direction changes. The engine builds power as the revs continue to climb, tapering off approximately 1000 revs shy of its 12,500 rpm redline. More impressive is its pull coming out of slow corners, as T-Hill West has a few extremely slow, tight bends taken in second gear on the R3. On occasion, I’d botch a downshift and lug through in third. To my delight, the Twin would pull nicely without any fuss. Were I to build a track R3, I’d address tires, suspension, brakes and slipper clutch. Michelin’s Pilot Street rubber reveals its intended environment right in its name. The silica-rich compound makes it a great street tire as it warms up quickly, but when pushed its edge grip is adequate at best. That said, suspension is adequately calibrated to the limits of the bike with those tires and the smooth surface of the track. The R3’s standard components make it a fun track toy, but a few choice pieces could fully exploit its performance potential. With stickier rubber, you could brake later, accelerate earlier, carry more corner speed and lean further. Then you’d need more compression and rebound damping to cope. With relatively little power in stock form, when pushed to its limits the rear chatters and slides when knee-dragging lean is met with throttle. Luckily, it communicates this early and often, giving the rider plenty of notice to dial it back a notch. After repeated hot laps, the brake lever would start to edge closer and closer to the bar. Luckily, Yamaha’s accessory stainless steel line would solve this problem. The bigger issue here, however, is the lack of a slipper clutch. Its omission (and that of ABS) was done to meet a price point, but downshifting from high speeds requires perfect rev-matching and careful clutch operation to keep the rear from dancing all over the pavement. 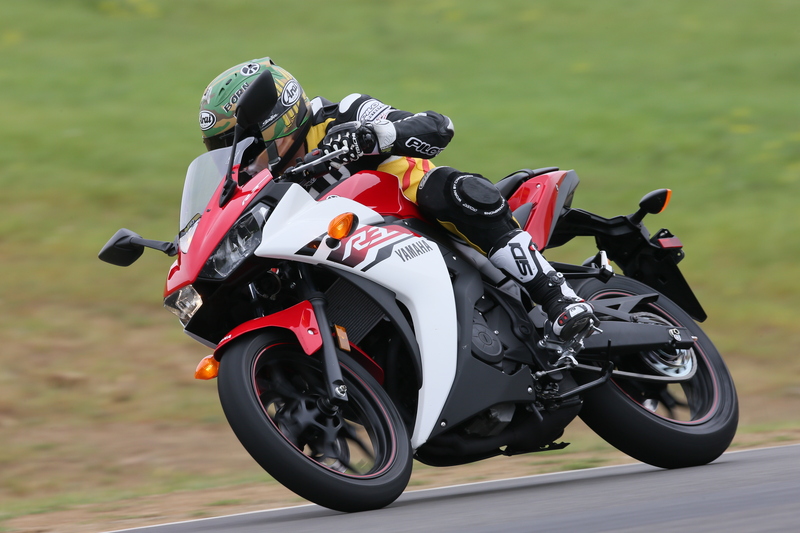 Despite what you see above, knee-dragging lean angles are entirely possible with the stock R3. With the possible exception of the slipper clutch, these are minor issues to address. The R3, while being a street bike first and foremost, rips around a tight track better than its Japanese competitors, in my opinion. Clearly, a showdown with the KTM RC390 is in order. Yamaha might have taken its sweet time introducing a beginner bike to the U.S. market, but the R3 doesn’t disappoint. With strong, yet manageable power that blows away its (Japanese) rivals, riders of all levels will get a kick out of it. A low seat height and nimble chassis just sweetens the deal. With pricing set at $ 4,990, the R3 is positioned just below the Ninja 300 ($ 4,999) and well below the $ 5,499 KTM is asking for the RC390. It might have taken Yamaha a while to bring a beginner bike to the U.S., but the wait was well worth it. Available in Raven, Team Yamaha Blue/Matte Silver, or Rapid Red, Yamaha hopes to have bikes in dealers as soon as labor issues on America’s western ports are resolved. Until then, rest assured Yamaha has hit yet another home run in the R3. $ 9 cheaper than the Ninja 300! 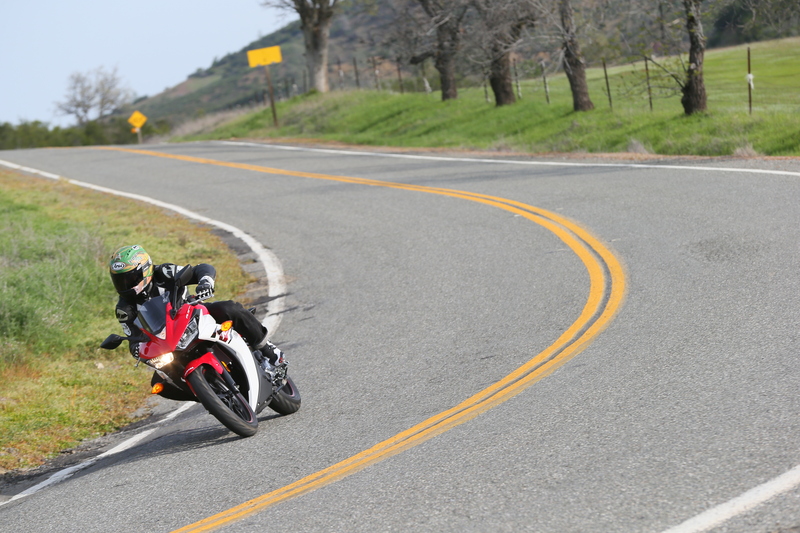 2015 Yamaha YZF-R3 First Ride Review appeared first on Motorcycle.com.